In one graceful movement, he dismounted the pinto then stepped to the porch where Maggie stood with unrestrained tears that flowed down her cheeks. 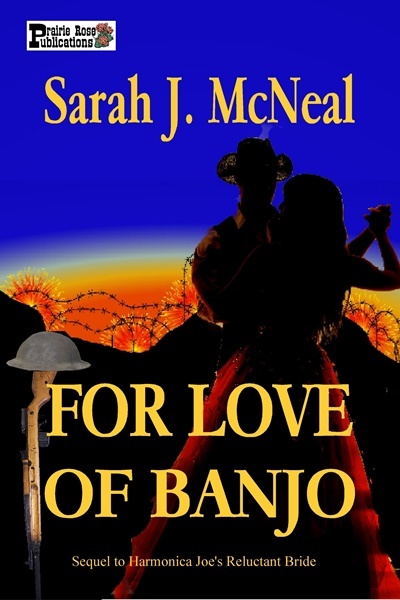 Banjo swept her into his arms and kissed her. The kiss wasn’t his brotherly, friendly peck on the cheek. He kissed her with a slow burning need and ran his tongue along the groove of her lips then slipped inside. He tasted of coffee and mint. Maggie reached up to weave her arms around his neck. She stepped on her tiptoes to better reach him and taste him. Her heart raced and heat rushed hungry waves of yearning into places in her body she never knew existed as she responded to his explorations with her own. If only she could slip into his pocket and follow him wherever he went. She wanted to become the marrow in his bones, to always be a part of him. Just when she thought he would take her to her room and make love to her as she had asked, the kiss ended. 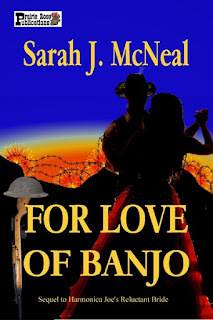 Banjo bent his head his rough cheek rasped against hers. The fragrance of him, a combination of horse, pine and crisp snow, caressed her senses. He slipped his hand into her hair and gently rubbed the tender skin of her neck where her blood pulsed beneath his thumb. Once the men had climbed out and headed for safety, Banjo climbed the wall and crawled out onto the flat, barren ground between him and the next trench. A glance behind him gave Banjo the unfettered view of the huge metal vehicle with treads wrapped around wheels that moved it over impossible terrain. He heard rumors about these new weapons. Tanks. Jesus, nothing could stop the thing. As curiosity overtook him at the wonder of such an invention, Banjo did the unthinkable and stood to get a better look. Something hot bit into his flesh, first in his chest and then his leg. The support of his legs seemed to disappear from beneath him and he fell. Just before the dark void sucked him under, he saw a face, a familiar face. He couldn’t quite make it out because he couldn’t see through the blood smeared over the lenses of his glasses. The lips moved but he couldn’t hear what the face said as if the apparition spoke to him through oceans of turbulent water. Maggie. Oh Maggie, darlin’, I’m so sorry. Then everything went black.